If there is one thing students from Wake County know best, it is the anxious waiting by the phone or computer for one little tweet from the Wake County Public School System (WCPSS) Twitter account. For most, this is a jokey, funny affair, with tweets tagging or replying to WCPSS with funny gifs or silly, begging, ultimatums or deals saying things like “This ain’t it” or “@WCPSS my house is flooded” (with an attached stock photo of course). While these interactions can be funny, real danger lies in Wake County’s inability to make hasty decisions. Regarding the recent Hurricane Florence, many students were out of town to escape floodwaters and anxiously begged WCPSS for a verdict on whether or not class would be held, to see if traveling was necessary. Many students experienced flooding or serious damage to their homes, or in one case, lived in close proximity to a stoplight that was broken due to power outages, which can cause a crash. All of these and more pose potential threats to students travelling to school. When WCPSS refuses to address these queries, the threat to students having to deal with these circumstances becomes even greater. Many students cannot deny and are willing to accept the fact that, in the end, we must attend school. 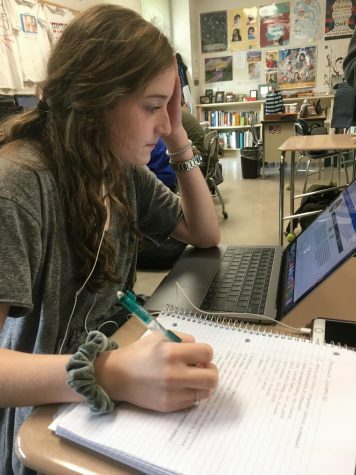 Even though many find it humorous to ask for a few more days to have fun with their friends, ultimately they must return to their places of learning, and complete their homework in preparation. But when students must attempt to attend school with the presence of hurricane evacuees, when they risk dangerous conditions to attend class for a few hours. Occasionally, students must abandon single parents or other family members in need surrounded by damage to their homes just to prevent the work for school officials that accompanies a make-up-day, the line must be drawn. Another issue with the online conduct of the School System are the snarky messages from the WCPSS Twitter personnel that demean and offend students. It creates a dangerous dynamic where an adult talks to children online with the attitude an adult would address a peer with, which is dejected and sarcastic, a way many believe no adult should ever address a child. The theme of being “behind a curtain” on the internet and not truly realizing one’s actions seems to apply here, but in a truly poisonous manner. This cannot continue the way it is. If the Personnel behind the Social Media were to respect the students who interact with it, Students would in turn, work harder to be more polite and to re evaluate the interactions they make on the account.